I love the colors and the lighting effect, it looks amazing -- and her eyes are just hypnotizing ! 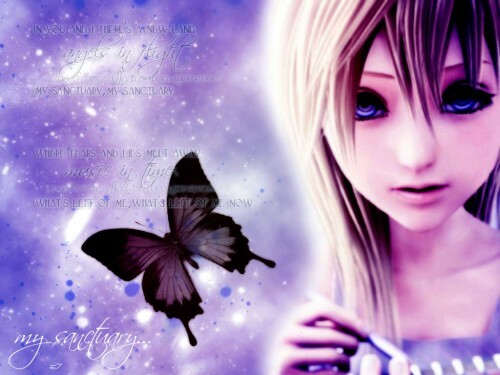 This is really pretty... is that Kairi or Namine? The purple shades add a softer mood to it, and I really love the butterfly, great work! This is soft and beautiful...the innocents comes through her eyes...wonderful! The girl is Namine ;) nice wall btw. Nice! But somehow she creeps me out. I mean the image, not the character. It must be the eyes. Don't get me wrong, I think your picture is awesome and I liked it! I guess it's just the way her eyes look. Quote by MarjorieNice! But somehow she creeps me out. I mean the image, not the character. It must be the eyes. Don't get me wrong, I think your picture is awesome and I liked it! I guess it's just the way her eyes look. Wow O.O double Wow! Oh the colors! It's..... beautiful gorgeous ;_; so so sweet! Namine sweet Namine ^^ we didn't get to see her enough, if only... poor nobodies... I guess this work makes me a little sad, nostalgic actually... yes... there's something about her expression that makes me feel like this, but for me there's no fear. The wall is great, but I think the butterfly stands out too much. Because Namine sort of fades into the bg,and the butterfly doesn't, the eyes are naturally drawn to the bug(:P) instead of Namine. Very pretty, adding the song lyrics was a nice touch.